If there’s one thing we dislike almost as much as crime, it’s public officials who lie about what’s being done to combat it. A lie built on a promise from an untrustworthy man. 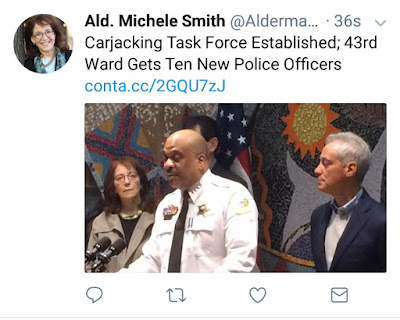 And Lincoln Park Alderman Michele Smith (43), whose ward has seen a 100% increase in robberies so far this year, is spinning all sorts of bogus information lately. Chicago police officers are not assigned to aldermanic wards. They are assigned to police districts. We have learned that Chicago Police Superintendent Eddie Johnson actually said that he would shift ten additional officers to the 18th Police District—a slice of the city that contains parts of four wards, including Smith's. Even if Johnson follows through on his promise—and we are highly skeptical that he will—the ten cops won’t be assigned to Smith’s ward. While we’re at it, ten additional officers amount to virtually no impact on day-to-day policing. Figuring that four of the ten will be off of work on any given day for their weekend, vacation, or sick pay, that leaves an effective increase of six officers in the district per day. Divide that by three shifts and it’s an increase of two officers at any given time in the 18th District—which spans from the Chicago River to Fullerton and Lake Michigan to the river’s North Branch. Now, let’s take a look at Johnson’s credibility when it comes to promising an increase in officers to aldermen. In 2015, Lakeview Alderman Tom Tunney (44) voted in favor of the city’s massive property tax hike plan after (he says), Mayor Rahm Emanuel promised to raise the 19th District police force to a minimum staffing of 376 cops—still well short of the level of 483 that used to protect the area. 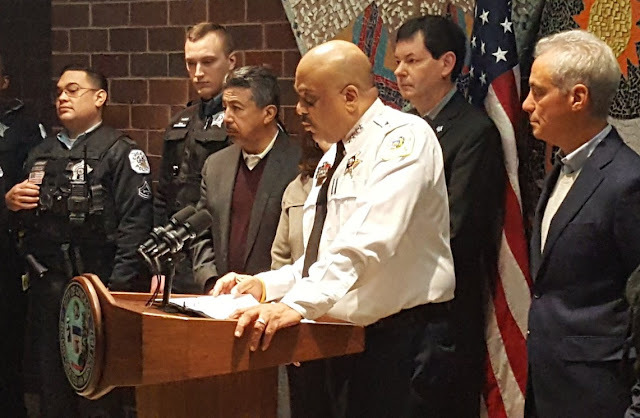 Despite the mayor’s purported promise, and Tunney’s incessant urging that his constituents contact Emanuel and Johnson to demanded that they fulfill their obligations, the 19th District has had fewer than 376 officers since last June. So, good luck getting those ten officers you’ve been promised, Alderman Smith. You’re gonna need it. We love bringing you exclusive stories and hyper-local coverage. Can we count on you to help offset our expenses? We'd REALLY appreciate it. Click HERE to help out.